The dry land is one world and the wet sea is another, but the line separating them is ever-changing. Known as the intertidal zone, the area between the land and the sea is defined by the extremes of the tides. Sam Hinton provides an introduction to this fascinating zone and its contiguous waters and to some of the many creatures who make the southern California seacoast their home. This highly readable book has been for many years the handiest resource available for anyone wanting to explore that region's delights and mysteries. The book is filled with interesting anecdotes and drawings and has a thorough discussion of the natural forces¯the tides, winds, storms, currents, surf, and ocean chemistry¯that affect near-shore animals. 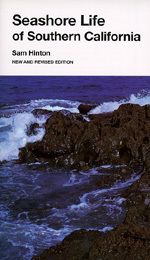 Also included is a section relating the ocean forces to the intertidal habitat, along with a map of southern California locations where one might observe the organisms described in the book.